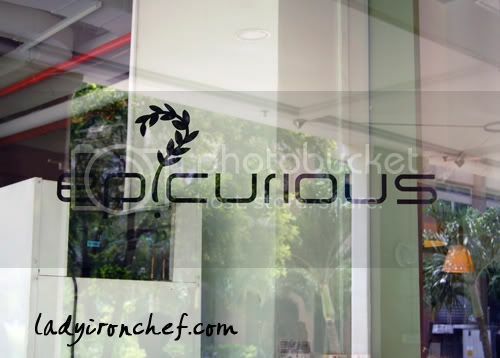 Epicurious, located on the banks of Robertson Quay, has been in operations for close to 6 years now. The restaurant is the brainchild of the duo owners, Helena and Sharon. The concept for the restaurant is like a neighbour joint, serving casual food where you can chill out and enjoy a meal without any qualms. The interior of Epicurious is surprisingly small, from the outside i thought it will be bigger. There are only three tables inside, with most of the seats in the al fresco area. 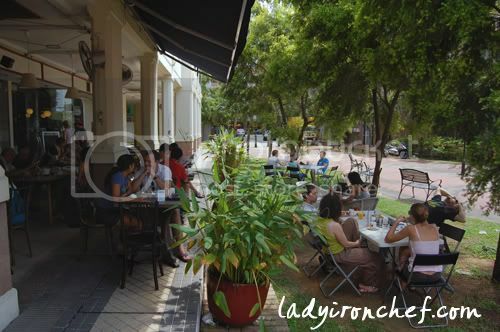 The al fresco area offers a view of the river by Robertson Quay, its simple furniture make it seems as though you are having picnic out in the natural. 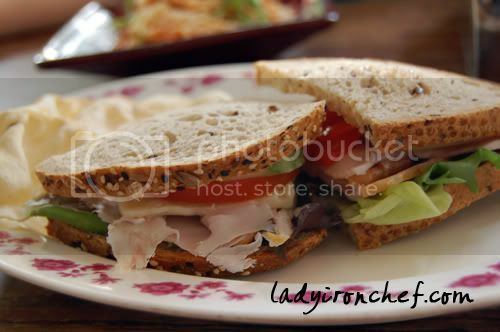 The food which Epicurious offers are simple and comfort food, like sandwiches, salads, pasta. On weekends from 9am to 1pm, they have the brunch menu which include choices like pancakes, toast, bagel, eggs, ommelette. 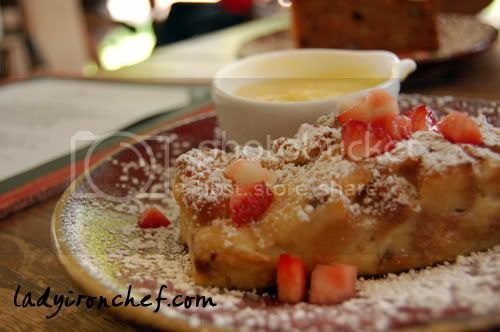 And i am really tempted by their brunch menu, you’ll be seeing them here in the near future. 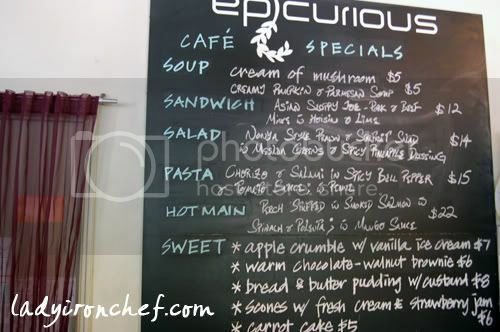 At Epicurious, there is the blackboard specials, which is not on the normal menu, and these are changed regularly to allow customers to experience different type of food. The lunch menu does not have much selection of mains, in fact they only have three to choose from, with mostly sandwiches and pasta otherwise. For dinner, the menu is a different one all together, with starters like beef carpaccio, smoked salmon tartare, to main course like their signature epicurious burger, and there are also quite a variety of grills to choose from. Price ranges from 10s to 20s. Turkey Breast with roasted bell pepper and havarti cheese. The sandwiches are all freshly made with lettuce, tomato, and cucumber, with choices of country-style white or wholemeal sunflower bread. The turkey breast sandwich is fairly good, served with keropok. 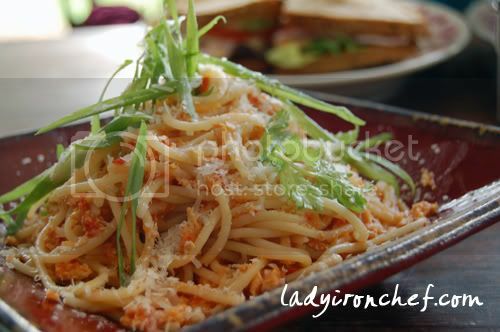 The chicken bolognaise spaghetti is served with cheese flakes, your good old reliable fix of pasta. Pork and beef mince with hoisin and lime. 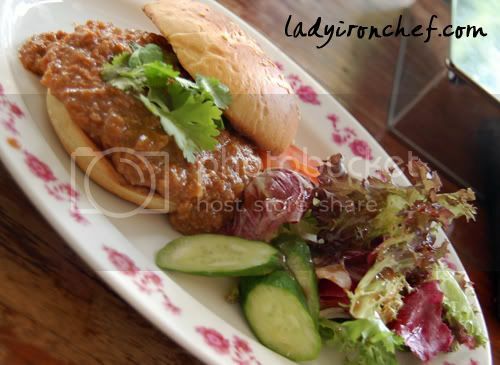 The Asian Sloppy Joe is under the blackboard special for sandwich. The unique name caught our attention, and the sandwich does not disappoint. The pork and beef mince combination creates a rather distinctive taste, slightly sweet and spicy. House-made beef patty with sautéed onions, mushrooms and fries. 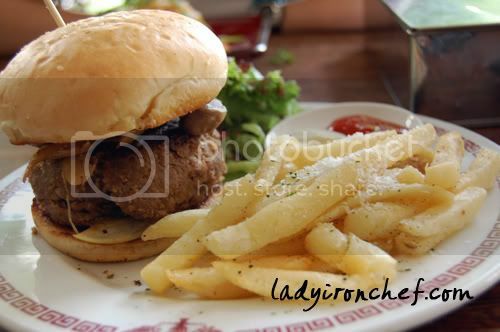 The Epicurious Burger is the signature dish of the restaurant, having heard many good things about the burger, it is inevitable that this is a must-try dish when you visit epicurious. Although i just had burger at Seah Street Deli the previous day, but i have no qualms tasting the epicurious burger. And indeed, the Epicurious Burger is the star of the show, the beef done medium-rare, is tender and retains the juiciness of the meat. And you can choose to add cheese, bacon or a fried egg for $2 each, or $4 for all three. But i choose to serve my burger the original way without any toppings. I like the fries too, which comes with cheese flakes, the overall taste is buttery and cheesy! 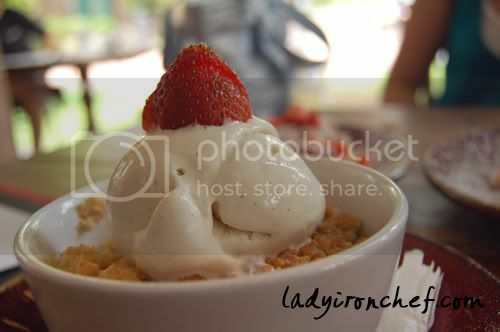 The Apple crumble with vanilla ice cream is recommended to us by Helena the owner of Epicurious. Now who can finish a meal without having desserts? Definitely not me! The apple crumble is sour-sweet, and the taste of it together with ice cream does it for us. The bread and butter pudding is also another of their more popular desserts, the way to eat it is by dipping the pudding into the custard, but i preferred to taste the bread and butter pudding on its own. 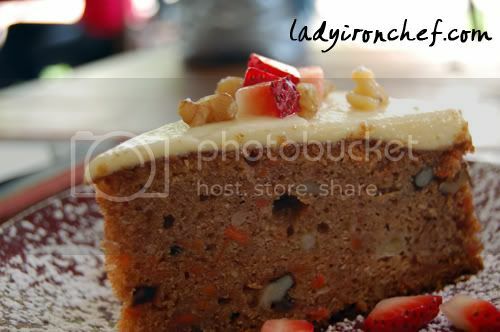 A slice of the Carrot cake is enough for anyone to end their meal on a high, and the cake certainly taste good here. With a layer of cheese on top of the carrot cake, the effect is a melt-in-your-month. The cheese is relatively light and does not overwhelms the carrot cake. Total bill is $82.48 for 4 mains and 3 desserts. However, Helena kindly has the desserts on the house, so the total bill is $64.90 instead. The owner Helena is friendly and warm, we had a chat and she explain the concept of Epicurious to us. So if you saw her at the restaurant, do not hesitate to have a chat with her! The current location however is a tad too small, and cannot serve more customer. But then again this can be a double edge sword, more seats serves more customers, but in the process you might just lose the wonderful ambiance of the place. And by the way, Helena and Sharon have recently opened another fusion western-local restaurant, Persimmion which is located at the Link Hotel. Do give them a try if you pass by Tiong Bahru area. 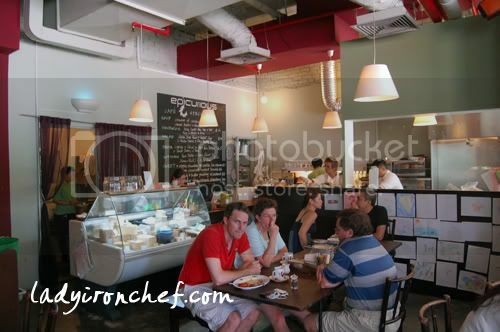 Epicurious is one place which i’ll gladly return again to try out their brunch and dinner menu. The reason is simple, Epicurious serves casual food, the price will not hurt your wallet, and the ambiance of the place is relaxing. Despite my usual practice of not repeating visits to a same restaurant, i’ll bend the rule this time, for Epicurious! their burger nicer than seah street deli’s texas burger ah? hmmm! anyway i’ll be off to aussie for the next month. Will probably try to taste the local cusines and enjoy basking away in the sun drinking tea and eating scones… hehe. Will try to post on those as well!